Twelve year old Gabrysia (Michalina Swistun) has a crush on the prettiest boy in school Szymek (Nicolas Przygoda). Gabrysia isn't the thinnest or prettiest girl in class. From a good home and a top student, Gabrysia isn't going about this crush lightly. She's done her research, hired a popular classmate to investigate her chances and plotted out the perfect place to reveal to her crush that she has fallen in love. It's the final day of school and it's now or never. It seems Szymek might even like Gabrysia back but if nothing else peer pressure prevents him from accepting the overweight girl that his friend Czarek (Przemyslaw Balinski) calls Fatty. The two boys have bonded as best friends in their commonalities of a difficult home life and their growing habitual smoking habit. Blackmailed into meeting Gabrysia after school, Szymek brings Czarek along. Gabrysia's big reveal doesn't go as anyone expects leading to a spiraling effect with an end so abruptly shocking it may disturb some viewers. Playground focuses primarily on the three children mentioned above, covering a single day of their lives. Each of their home lives is presented in opening segments, showing the differing backgrounds each child comes from. Their final day of school is broken into segments as well, creating the love driven plot from a twelve year old girl's heart. The afterschool special segment isn’t for kids, turning a coming of age tale into a real horror story. The children's performances sell the movie as a realistic whole. Michaline Swistun crushes fantastically on Nicolas Przygoda's Szymek. I really enjoyed her performance and the realism of the character herself. Przemyslaw Balinski will make you hate him as the bully Czarek. The entire film you're waiting for him to do something awful while unable to predict which direction it's going to come from. 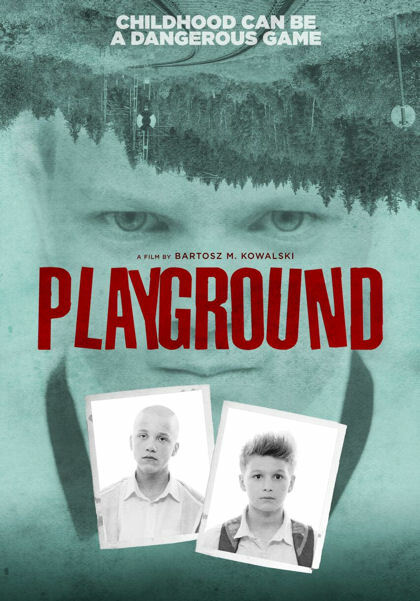 After watching Playground I thought Nicolas Przygoda was too much of a baby face to play the role of Szymek. Upon further consideration I realize that I bought Szymek as our lead protagonist. I believed in Szymek and genuinely felt let down. That's powerful filmmaking and what may make Przygoda's performance the best in the film. Domumentarian Bartosz M. Kowalski brings a true story from 1990's Poland to the big screen in his first scripted feature. The result is an interesting film that's shot in the documentary style Bartosz knows well while not being presented in a found footage form. Kowalski directs the most realistic school age interactions that I've seen in cinema since the acclaimed 1995 film Kids. The short 80 minute runtime is a paced build. Much like Kids, the mundane actions of everyday life is at times hard to wait on. Long shots of distant actions are additionally annoying. Also like Kids, the final minutes of film are so disturbing it makes everything worth the wait. Watch it until the end and tell me that isn't horror.